What is a Da Form 3749? 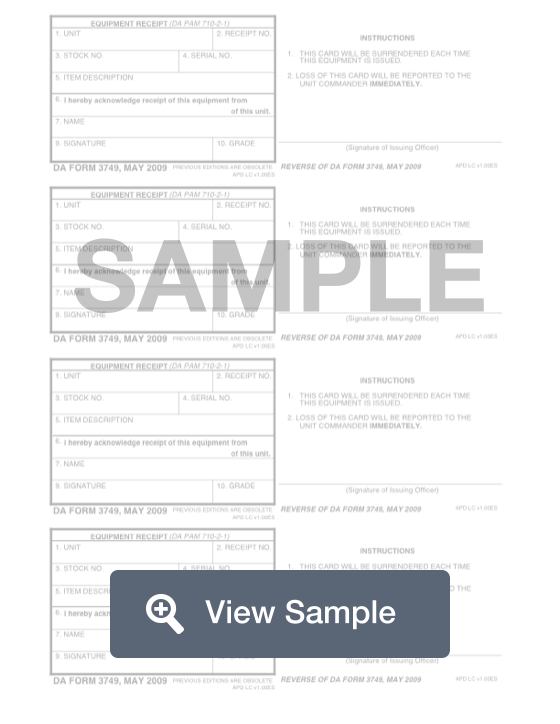 A fillable DA 3749 Form is a document used by the US Army. It is also known as an Equipment Receipt. It is completed when equipment is issued to an Army unit. The stock number and serial number for the equipment is listed on this form. The person receiving the equipment on behalf of the unit must also list their name and grade as well as sign the form. This form is used by the United States Department of the Army. It is known as an Equipment Receipt and will be used when equipment is issued to a unit in the U.S. Army. It will require various information that applies to the equipment as well as to the unit that is using the equipment. For the equipment, the stock number and serial number are needed. There is also a section for a description of the item. The unit will also need to be listed, and each receipt will have a specific number. The bottom section of the form will be filled out when the equipment is issued. The person receiving the equipment must put their name and grade at the bottom, and then sign the form. Create a free Da Form 3749 in minutes with our professional document builder.